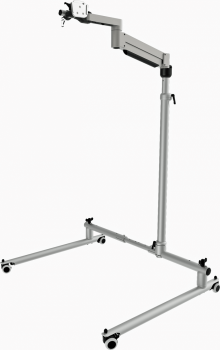 Versatile rolling floorstand for communication devices, free floating articulated arm, base width and column height adjustable. Low ground clearance for positioning devices over beds, sofas, recliners or wheelchairs. Column height 103 - 173cm (40" – 68"), Frame width 79 – 130cm (31” – 71”). Quick pack features & rolling bag. Space saving: The adjustable width from 24“ to 44“ makes the bars stand very closely to your seating furniture which provides freedom for the footwell area, especial-ly for persons attending. Quick Pack: The optional Quick Pack feature allows to fold down the stands in literally no time. The handy rolling transpor-tation bag takes the edge of travelling with the equipment, in case it is used in several places. OneHand: Adjustment by Fingertip! All device weight is carried by the OneHand Arm. Move your device effortlessly & free in 3D space! 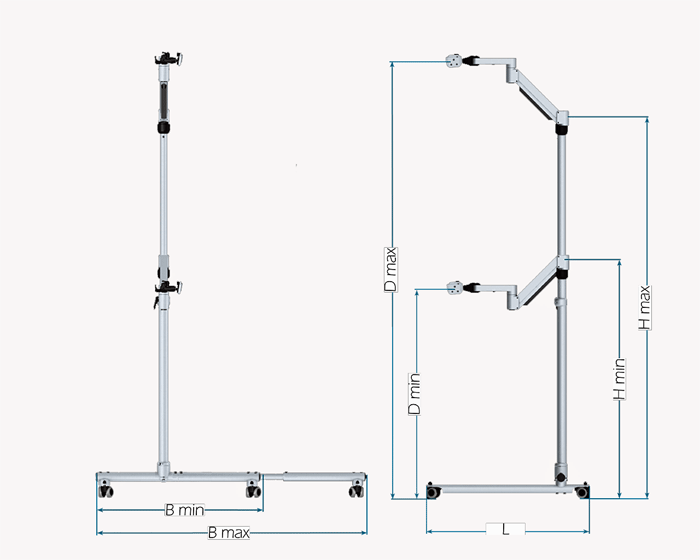 Width (B): 79 - 130 cm | 31.1" - 51.2"
Length (L): 79 cm | 31.1"
Height (H): 118 - 188 cm | 46.5" - 74.0"
Device height (D): 103 - 211 cm | 40.5" - 83.1"
Tube 1: 34 cm| 13.4"
Tube 2: 33 cm | 13"
Weight: 10.4 kg | 22.9 lbs. Load capacity: 2.0 - 6.0 kg | 4.4 - 13.2 lbs.